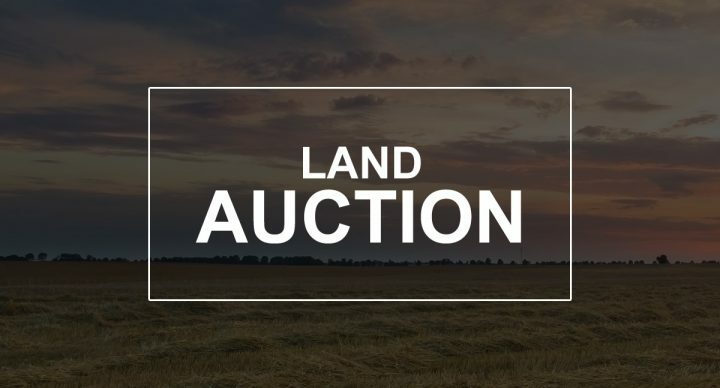 We will offer the following real property at auction at the land located from Olivet, SD – 2 miles west to the Jct. of Hwy’s. #18 & #25, then 3 miles north on Hwy. #25 and 1 ¾ miles west on 283rd St.; from Tripp, SD – ½ mile north, then approx. 12 ¾ miles east on Hwy. #18, then 3 miles north on Hwy. #25 and 1 ¾ miles west on 283rd St.; or approx. from Parkston, SD – (Jct. Hwy. #37 & #44) – 14 miles east on Hwy. #44, 7 miles south on Hwy. #25 and 1 ¾ miles west on 283rd St. This productive and high percentage tillable parcel of Hutchinson County, SD land will be offered as a unit According to a survey and plat as prepared by McLaury Engineering, Inc., this property contains a total of +/-78.58 acres, which according to FSA information has approximately 77.31 acres of cropland with a 14.9 acre corn base with a 156 bu. PLC yield, a 6.6 acre soybean base with a 32 bu. PLC yield, a 4.7 acre wheat base with a 26 bu. yield and a small oats base and is enrolled under the County ARC farm program election. According to the Hutchinson County Assessor this farm has an overall soil rating/parcel rating of .752, comparatively info. obtained from Surety Agri-Data, Inc. indicates this land has a Productivity Index of 71.6. The general topography of the cropland is level to gently rolling. This land would make an excellent addition to a row crop farming operation and/or investment property as this farm has a very high percentage tillable. This is a desirable parcel of Hutchinson County, SD land that truly must be seen to be appreciated! LEGAL DESC. : Gov’t Lot 1, Exc. that portion of Dangel Tract 1 contained therein & Gov’t Lot 2, all in the NW ¼ of Sec. 30, T. 98N., R. 58W., (Wittenberg Twp. South), Hutchinson Co., SD – (essentially the W½ NW¼, exc. a small portion of the acreage site). TERMS: CASH – A 10% nonrefundable earnest money payment sale day & the balance on or before January 11, 2019; Full Possession for the 2019 Crop Year. Marketable Title will be conveyed and an Owner’s Title Insurance policy will be provided with the cost of the owner’s policy divided 50-50 between the buyer and seller. The acres in this farm are based on the acres as stated on a survey and plat as prepared by McLaury Engineering, Inc. of Parkston, SD, with the acres understood to be “more or less”. The sellers do not guarantee that existing fences lie on the true and correct boundary and any new fencing, if any, will be the responsibility of the buyer(s) pursuant to SD Law. All of the 2017 RE taxes due in 2018 in the amount of $1,214.32, as well as all of the 2018 RE taxes payable in 2019 will be paid by the sellers. This property is sold in “As Is” Condition and the information contained herein is deemed to be correct, but is not guaranteed. The RE licensees in this transaction are acting as agents for the seller. This property is sold subject to existing easements, restrictions, reservations or highways of record, if any, as well as any or all Hutchinson Co. Zoning Ordinances. Sold subject to confirmation of the Owners. For additional information, contact the auctioneers.